Hello everyone! 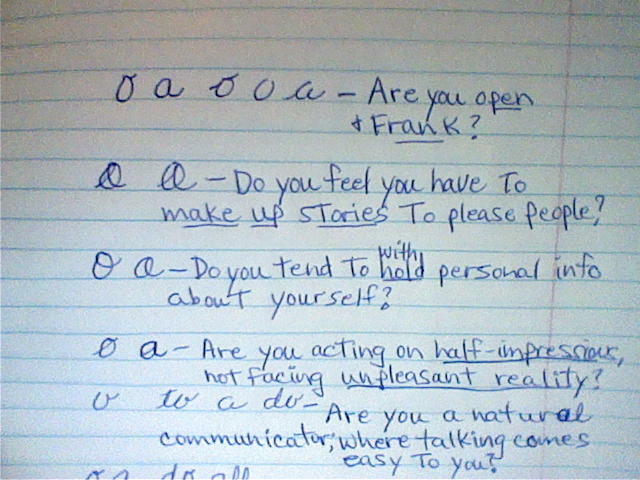 Welcome back to the world of handwriting analysis! Today we are going to take a look at your lower case letters, ‘a’ and ‘o’. These letters tell us how you ‘communicate’. The Webster dictionary says to communicate is to convey knowledge or info about; make known (to share). In other words when you communicate you are impacting or bestowing–revealing and sharing with others. We are looking at the verbal way of communicating. So, with this in mind, let’s take a look at your a’s and o’s. Are they open? Do they have lines through them or loops? 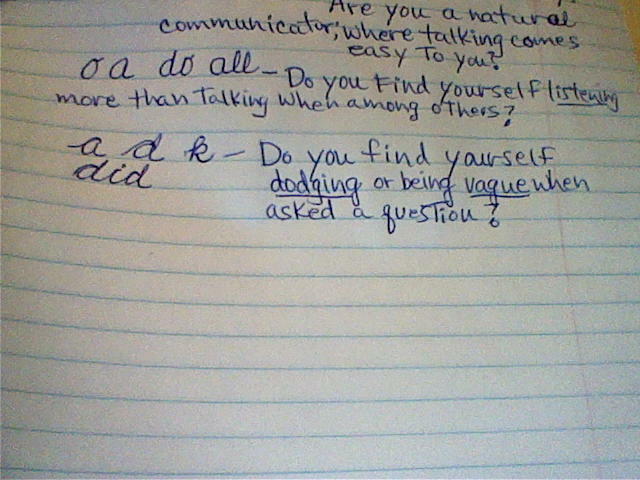 Let’s take a look at the examples below and see if you can spot your communication letters! Let’s look at the first line of a’s and o’s where there are no lines, or loops inside the round area. This writer will be honest, and frank in communicating. The second set shows loops in the right, and left side of our lower case a and o. This person will definitely tell a little white lie. If the inner loops are large and cross a lot we can say this person lies pathologically. The next set shows a circle on the right side. This writer is secretive, not in a bad way, just doesn’t tell their whole life story! The bigger the loop, the less you will get a complete answer from this person. The fourth set shows the inner loop on the left side. It’s like someone drew a line through our a and o. This writer is deceiving himself. He is not facing some unpleasant realities in his life, and doesn’t even realize it. Next, is our talkative writer. He has no problem communicating verbally. If the a’s and o’s are open wide, you can be sure it will be hard to get away from their chatter! Let’s look at the opposite of our talker. The a’s and o’s sealed. This writer is not inclined to talk so freely. He is quiet, withholding information until someone asks him a question. Our last set shows evasiveness. You can see the double-hooks in our example above. These writers will intentionally be vague, not giving a straightforward answer. So, as you can see we communicate differently with each other.